Batter Up! 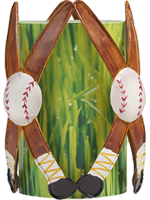 This two-piece set is a homerun for any baseball fan, and looks great in kids’ rooms, man caves and sports bars. 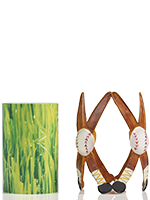 The Accent Shade features nostalgic bats and balls and the Warming Shade resembles blades of grass. BASE NOT INCLUDED. Measures: Liner: 3.5” diam. x 5.5” h. Accent Shade: 4.15’’ diam. x 5.75’’ h.